class="post-template-default single single-post postid-355865 single-format-standard custom-background group-blog header-image full-width singular wpb-js-composer js-comp-ver-5.7 vc_responsive"
CURTIS, Neb. – This is a quiet time on the NCTA campus with most members of our college community at home with family enjoying the holidays and catching up on family events. 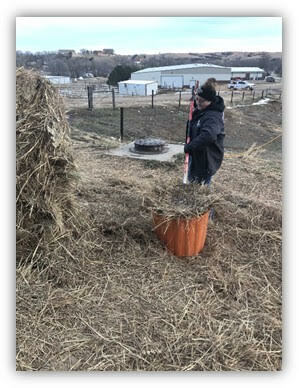 However, responsibilities continue at the Nebraska College of Technical Agriculture in maintaining the Curtis campus and surrounding farm and livestock enterprises. As a winter storm moves into Frontier County and much of Nebraska, several staff and students are tending to essential activities. College livestock are fed and cared for by student employees who live locally. These NCTA Aggies look forward to the opportunity to earn some extra spending money during the University’s holiday break. Others have the responsibility for the dogs, cats, furred and feathered pets, and exotic animals housed at NCTA. We maintain a large inventory of animals to meet the needs of our teaching programs in veterinary technology, animal science and equine management areas. As a result, student workers dedicate several hours a day to to maintaining facilities and food for the animals. Some staff also provide oversight for those chores. Faculty and staff are on call throughout the year to handle any questions or emergencies which may occur with campus animals. Student employees have directions to call their on-call contacts if animals are sick, hurt or missing. Though infrequent, health situations can occur, regardless of the season or time of day. Other college staff provide campus security throughout the year. And physical plant operators are on call to handle any emergencies at college facilities. The NCTA campus is more than 100 years old and it still retains its original academic buildings. Occasionally our older infrastructure reminds us of its age when a water pipe breaks or a steam line fails. At times like that, alarms go off and employees are quick to arrive at campus to solve the problem. We appreciate the dedication of these employees and their knowledge and skill as they work to keep our campus functional. Holiday breaks also provide us with an opportunity to reflect on the previous year and NCTA’s mission for the future. We check on our progress as an academic institution. Our leadership team designs adjustments to our procedures, as needed, in a continuous effort to improve NCTA’s effectiveness at creating successful graduates. On January 4, before classes begin the following Monday, the college will gather partners from across the state for an evaluation and planning activity. The NCTA Statewide Advisory Council comes to Curtis to join us in developing our next five-year strategic plan. This advisory council consists of professionals from various constituencies across the state including higher education, state government, agricultural industries, secondary education, parents, alumni and students. The group will review a draft strategic plan which has been developed by various advisors, internally and externally, of our college community. Annually, the Statewide Advisory Council convenes at NCTA, and throughout the year communicates electronically, for input to campus. Next week, the group will make recommendations for improvement, addition or modification to the NCTA Strategic Plan. We appreciate the assistance of our extensive college community from throughout Nebraska. We value their insights and the time they dedicate to NCTA in developing this important roadmap for campus facilities, services, staffing, and most importantly, the academic success of Aggie students. NCTA strives to expediently respond to the emerging workforce development needs of Nebraska’s agricultural industries. The NCTA Statewide Advisory Council helps us achieve that mission. Thank you to all who supported Aggie students in 2018. Happy New Year!